We love to make something from nothing! Perhaps, one of the first recycled craft projects (just behind the milk carton house) was the egg carton ants art craft. 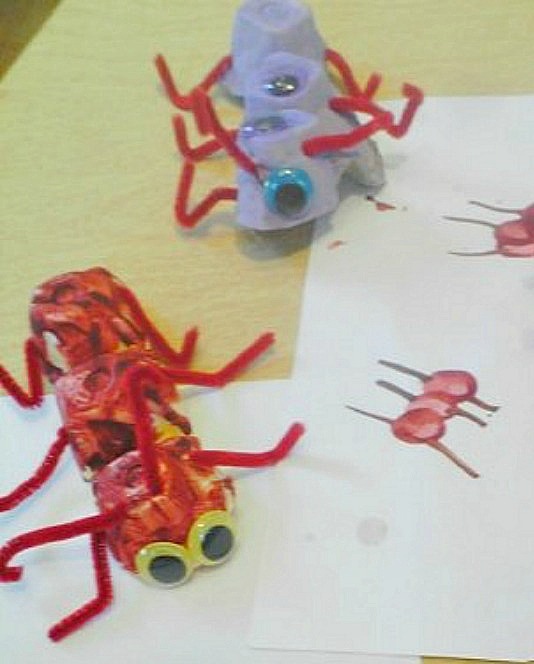 These cute little ants are fun for preschoolers to make, but they also work fine motor skills. So, what are you waiting for? 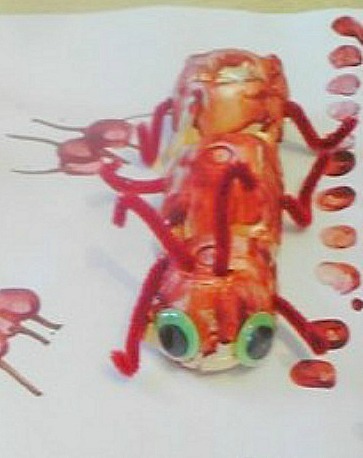 Grab your egg cartons and get ready to make some ants. We've added a few more ant art ideas, so keep scrolling and Enjoy! These egg carton ants were likely inspired by DLTK Crafts. Years ago, when Lora was a Director of a preschool program, she often found ideas at DLTK. We found these pictures from an old flip phone in the archives of our fun place for kids, The Play Connection (which has now morphed to an events and online marketing company). As always, we decided to try some variations on the original egg carton ant art. 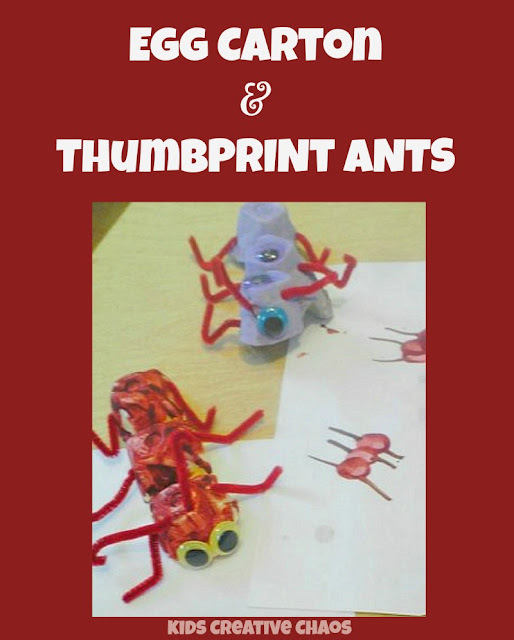 Make some paint to make your ant project colorful! Don't let the leftover paint go to waste. When you make the ants from egg cartons, place a piece of paper (think placemat) under your workspace. This will catch the glue, the scraps, and the paint. It also makes a great place to doodle. Use your fingers and thumb to make ant bodies with the paint. Then, grab a marker or a tiny paint brush and give your ants antennae and feet. If you use different colors, you can make Cooties, which is a fun activity to pair with the game. We don't like to waste anything. When you cut out your egg carton cups, there are some scrap pieces leftover. 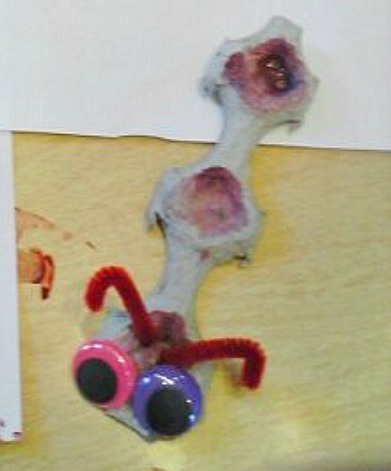 Use the scraps to make another kind of ant (if you add legs) or leave as it is and call it a Caterpillar. When making the traditional ants, pre poke holes into the cartons where the legs and eyes need to to go. You can even mark the hole with a Sharpie to make it easier for the preschoolers to find. 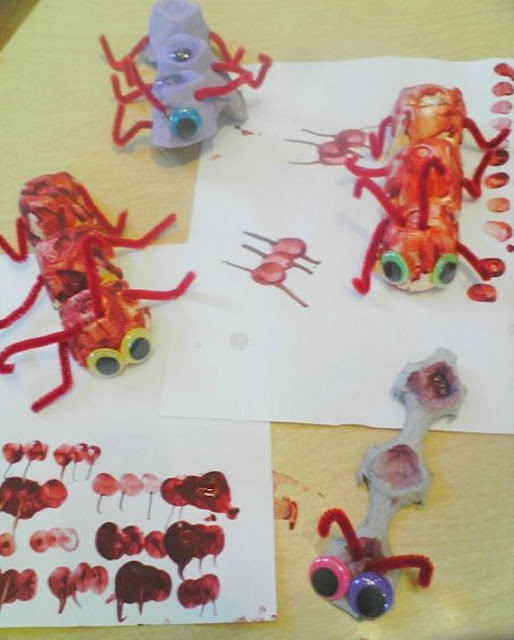 Then, the children will insert the pipecleaner into the holes- no glue required! Tacky glue is perfect to add googly eyes. Remember to have with it! When you are prepping your project, be sure to find fun ant music and companion books. Below, you'll find some recommendations for our favorite ant songs and stories.